There's a perfect time for everything! Finally I had my fair share of Mt. Guiting-Guiting climb experience. Originally set April of this year but it was cancelled and so I set myself to target it again in June, which of course, is already rainy season and therefore it didn't materialize. I felt the urge though of still climbing it even if circumstances seemed not to allow me yet to go there. Came a time that I stopped planning to climb it but i'm too curious of what it feels like to conquer a mountain which they say is seriously tough. Actually, when my climb buddy, Dennis, climbed it for the first time in December last year, I requested him to pick up a stone for me so that I could have a reason to return it this 2012 (hey, we broke the Leave No trace Rule) I held on to that promise. (Side story: Buddy Dennis Hisanan, in his first time to climb G2 made it to finish the traverse in about 19-hour dayhike. Yes, a dayhike! ^_^ ). So I set again a plan C setting the climb on the long weekend of November. Know what? I was hesitating but still said Yes. Unsure. Admittedly, I was climbing with an incomplete excitement, not so mentally prepared, unsure and with pressure. Never knew something very beautiful memories and experiences awaited me upon climbing this mountain. Mt. 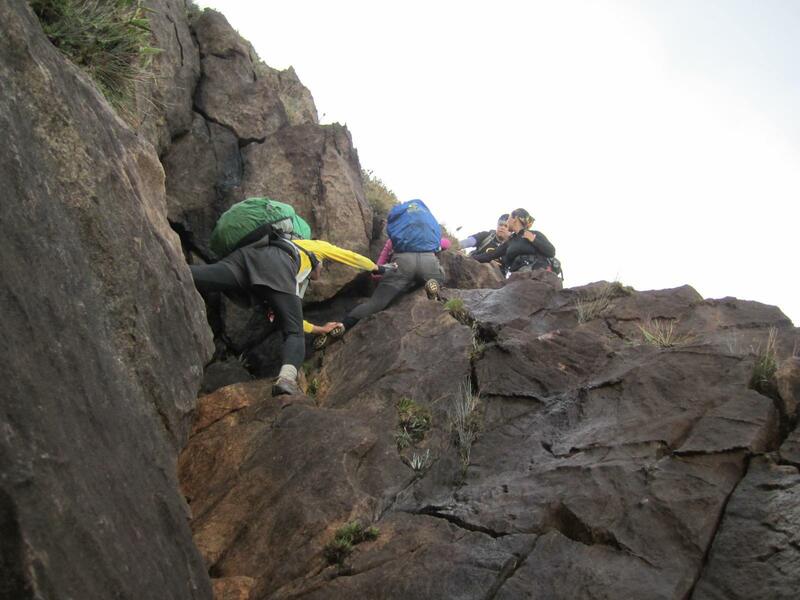 Guiting-guiting, in my opinion, is a dream mountain for every Filipino climbing enthusiast because of its intimidating difficulty that one could take pride upon every succesful conquest. Popularly known as "G2" by the mountaineers, it is considered as one of the most difficult and technically challenging mountains in the Philippines. Located in the heart of Sibuyan Island, Romblon, the traverse we successfully made was via San Fernando to Magdiwang. As of this blog, there are only two routes that can be done in climbing this mountain: first is the traditional trail in Sitio Tampayan, Magdiwang (backtrail) and the second one is the traverse, an entry point in Sitio Olango, Brgy. Espana, San Fernando exiting Magdiwang. The traverse was opened only in 2009 according to the guide, Tatay Remy Robiso, a popular guide of the traverse and one of those who pioneered the Olango trail. According to him, it was such a great accomplishment then for him when he was still a park ranger and working for DENR. In his opinion, the difficulty of this traverse is 10/9 since the traditional climb is already rated 9/9. Targeting G2 will not only require strength in climbing it, but also patience in hassle rides. You need to find enjoyment in long sailing thru ferry. And so a very long trip was faced by us in the quest of reaching the Sibuyan Island. It was Wednesday then and the ship route to Romblon was only up to Odiongan (Tablas Island). We traveled to Batangas Port in the afternoon and it was almost 7pm when the ferry left the port). It was an irritating ride. We bought the Fiesta Class ticket (non-aircon) and I just have to say this without mentioning the name of the ferry—bed bugs are rampant. I could not sleep well. I even got my arms swollen because of the bites. I just thought we should have instead taken the aircon room even though it would cost us more bucks, at least it could have been a comfortable ride. From Odiongan Port, we took two-hour jeepney ride to San Agustin Port but unfortunately there was no trip that would directly transport us to Sibuyan. So we had to ride a motorboat but we had to alight first at Romblon Port and then ride another boat to Sibuyan. It was really a hassle but it’s part of the adventure! We arrived lunchtime at Ambulong Port in Magdiwang, Sibuyan Island and then proceeded to a pre-arranged tricycle ride to San Fernando. It was a rough road trip overlooking the seashore on the side. To add more hassle to what we’ve been through, we got one of the tires flat. So as Kuya driver replaces it, we were given a time to take some pictures on the seashore. We arrived at Tatay Remy’s house in Sitio Olango, Brgy Espana in San Fernando and then later had a meet-up and asked for the blessing of the town’s Mayor (actually we have been warned of the mountain’s difficulty). We spent the night at Tatay Remy’s house. At 2am the following day we're already up and prepared everything. We started the trek at 3:30am. Since we should arrive at the summit before nightfall and we should reach each point at a designated time, we had to increase our pacing as much as possible. In a 30-minute steady hiking, we reached the Olango river. This is the first water source. We refilled our water bottles and containers. The next would only be at Camp 3 which we would probably hit before lunch. As we continue the trek, succeeding assault trails followed. It felt like it's a continuous cardiac trail of Mt. Makiling. We reached Camp 1 after more than an hour. Surprisingly, the next trail was literally rocks, both cliffs at each side . Truly, buddy Dennis is right when he told me that everything about the trail is rock. It' a very long steep climb, multiple times as Melkas ridge of Mt. Makiling. Just like what the guide says, anyone who does the traverse should have strong arms. Each step is literally a climb and one would require to exert his/her great effort in order to sustain the trail. To think, we just took the new trail called Team Outdoor Pilipinas and it's already tough. According to Tatay Remy, the old trail is harder-- a side trail directly facing the cliff. Throughout the trek, we encountered a number of beautiful flora and fauna and big pitcher plants. Some of them are same size as my shoes. On the other hand, buddy Dennis was not feeling well then. From time to time he threw up and he looked fainted. He was wondering, considering he already traversed the mountain through a dayhike last year and he was behaving like that. Probably it was because of lack of sleep and he didn't eat before we get started. Tatay Remy was also already asking him if he could sustain the climb but he pushed through and he made it until Camp 3 where we ate our lunch and thankfully he has recharged himself. He’s back to life! From such point, we were already behind our itinerary yet still within the maximum time we can stay there. Delayed though, the target was, we should be leaving Camp 3 by 1pm and favorably, at 12:45pm we were able to resume. From that point, we could completely view the rocky structure of the peaks of Mt. Guiting-Guiting. Extra care must be the first concern as when you look around, cliffs seem to scare you. The next target after Camp 3 was to reach the Crash site by 3pm. An open trail followed. There was an area there that I would not forget--- a side trek with a first glimpse of "kiss the wall" followed by a high assault by stepping into separate knife edge - shaped rock making a deep hole between the wall rock and such separate rock. Tatay Remy was supporting my steps. I was shaking for the first time with the “127 hours” movie in my mind. It's my biggest fear—Rocks, where I could be hanging along the cliff (now you may question why I still climb even with such fears.. I don't know either. Perhaps, I just know I can overcome it). We reached the crash site at 3:15pm and rested for a while. According to the guide, the site was already cleared and apparently, the only thing that remained there was a wheel along with a small piece of rusty part of the plane. The crash happened in 1990 and the bodies of the crashed private plane (they say some sort of military) were only found after 2 years because during that time, the search was taken in Mindoro Island. And I think, no one from the locals or climbers could ever discovered them as the Olango side was not yet attempted then. We continued climbing an approximately 70 degree-open trail. I was reminiscing the trail to Mt. Apo from Lake Venado, It's like that grassland climb to the top. Arriving at the peak after a few minutes of assaut, a bouldering trail awaits. It was beautiful especially when the clouds disappeared which gave us a good clearing. I was in awe. Truly, only those who dare to take the risk and hardship will be given a beautiful reward like that, a chance to witness a wonderful creation. What surrounds us was a pile of big sharp rocks forming the mountain. At this point, the porter went down for our last water source of the day. As of this blog, they say, such was newly discovered. Taking the name of the daughter of Romblon's governor, Trina, who has also already traversed the mountain. Hence, calling it Trina's Spring. At 4:10pm, we arrived at Remvaldely's Peak--- taken from the names of those who pioneered the traverse namely Remy, Valentin, Andy and Ely. Bouldering followed. Actually, approaching Remvaldely's peak is already rocky terrain. The challenge on the way to summit is that one would have to trek along such pile of large pointed rocks and a real effort is required. Holes are big threats of the trek. So as we mind the fact of tiring assault to the summit, we were also very focused on what our feet are walking at. It's very dangerous. That was sunset when we were doing the bouldering. As one or more peaks are shadowing the others, the sillhouette created is really scary because figures of sharp and pointed rocks are what we could obviously see. We enjoyed a very dramatic view of yellow orange sky along with the clouds. Nightfall came and we haven't reached the summit because apparently, our strength were gradually deteriorating owing to the fact that we're almost 14 hour- trekking as of that moment. We continued anyway until we were able to get to the top! It felt great to have come to that point. We intended to set camp there but thankful to Tatay Remy for introducing to us a campsite covered by trees and there, we're free from the threats of too much cold temperature and strong winds. It was just a 10-15 trekking down from the summit. We ate our dinner, took a rest and did our much awaited time to slumber. It wasn't that cold, of course still cold but different to what I have expected. (or I must say, compared to the summit campsite if we decided to stay there). The covered campsite kept us safe and somehow warmed us for the whole night. After eating our breakfast and being done breaking the camp, we're back to the summit and ready to traverse. We were so blessed to have that start of morning with a very fine weather. To my surprise, we were able to spot the silhouette of Mt. Mayon which seemed to glance at us confidently with its perfect cone. That was the kind of clearing given to us on that faithful day! We were also able to see a part of Bicol region. I returned the stone at the summit symbolizing I was able to fulfill my promise of climbing it. After taking pictures of the wonderful views, we had to start the descent. We were actually behind the itinerary since the target was to leave the summit at 7am but we only got to start the traverse by 7:40 am. I figured my subtitle here “Classical Traverse” is somewhat appropriate as the trails that we have taken on our descent are the trails where the first mountaineers who attempted to climb it were able to summit for the first time. It’s very difficult to descend given the fact that we had a very lengthy trek in the previous day. Most of all, the rocky terrain is really steep and cliffs seem to be very welcoming once you missed out stepping on the right rocks. Being very extra careful and focused is highly a must. As I look farther, anticipating the rocky terrain that we would be taking including the knife edged and Mayo’s Peak (which was then not so visible from where I was standing), my feet would not just want to move and step forward but all I thought was I wouldn't be able to finish the traverse and therefore won’t reach home. I was shaking when we reached the 90-degree point. I thought it’s not possible to go down with my loaded backpack while stepping down into rocks without any aid of a rope. (good thing I am into light backpacking, hehe). But Tatay Remy was there and assisting me. I was able to do it! Whew, but I was really still shaking while sitting down and waiting for my other companions to take the same dangerous descent.I didn’t mind watching as they descend. It frightened me. More rocky descents followed-- then reaching the Peak of Deception with Mayon appearing on the other side from time to time and then down to Mabel’s Spring where we took a 15-minute rest. The first few hours of our descent already consumed a great amount of my strength and it made me slow down. I was able to regain my strength after eating spaghetti and some biscuits. I was in awe again upon reaching the point where the saw-toothed peaks can be viewed closely. So, this is where the name of the mountain was originated-- Guiting-guiting which means "jagged." We reached the knife edge trail and I was back to life, our target was to reach Mayo’s Peak by 2pm. I enjoyed the trail. It was very dangerous, and it challenged me! What was on my mind then was: should I get back here after all of these and take again all of these difficulties? I also realized how I value my life that I have to be very careful every step of the way,of course with the mindset of successfully finishing it. Just like our journey in life, I guess. Mayo’s peak seemed to be unreachable and very far. We trekked, we trekked and we trekked and yet it was like we could not reach the peak.It was a very long knife edged trek to Mayo’s peak. Reaching Mayo's peak finally, we took enough rest and later prepared to descend again. After a few minute-walk was a spacious campsite. And there are no more rocks! I was telling to Tatay Remy, "that kind is the mountain I know." From Mayo’s Peak to Guiting-Guiting summit down to the other side, it’s was a peculiar thing to me ^_^ A mountain of rocks, a pile of rocks, that’s G2! We reached camp 3 at 4pm and it was kind of a long trek going to Camp 2, as we reached it at 5:55pm. It was only almost an hour down to camp 1. From there was totally night trek as we target the jump-off point in DENR Magdiwang. There are many forks along the way so we had to stay alert and follow the guide. We reached the beautiful Catingas River with a moonlight and full of stars upon gazing above. After that was a gradual steady trek until finally reached DENR at 8:30pm. And oh I could barely move my legs. We stayed at the resort of one of Magdiwang’s officials. The following day was a fine sunny day and smooth two-ferry trip to Batangas Port.Thankful to God, we made it! 05:00pm – ETD Batangas for Romblon. 05:00pm – Overnight at Sir Remy’s place. Amazing,Matelle. Hope to be with you in some of my future climbs. Awww.. very nice experience! Just reading this blog entry made me salivate in envy, for real! Hope I could be able to conquer this one! Kudos! Thank you for blogging your experience on your Mt. Guiting-Guiting traverse. I was wondering if you could help me provide some information. I'm with a group scheduled to climb Mt. Guiting-Guiting in March 2014. This climb holds special interest to me because back in January 1995 a helicopter crashed somewhere in those chain of mountains. All 3 passengers and pilot perished. One of the passengers was my father. I've been researching the exact whereabouts of the crash site from whatever source I can find. I'm hoping perhaps some of the locals you spoke to during your trip may have mentioned about a helicopter crash in January 1995. Any information would be most appreciated. Hi Matelle, would you mind giving me a budget of this climb. Di ko alam ang details and somebody is asking me about it. Pareho lang ng route natin and kindly include the schedule ng mga sasakyan and its sked transfers. Please, please. Kasi, iyong sa atin ay buong package naman ang binayaran ko so wala akong idea sa breakdown Thanks in advance.